I received a free copy for my honest review. Marion Grace Woolley is the author of three previous novels and a collection of short stories. In 2009, she was shortlisted for the Luke Bitmead Bursary for New Writers. She balances her creative impulses with a career in International Development; she has worked and traveled across Africa, Australia, Armenia, and a few other places beginning with ‘A’. She is an associate member of the Society of Authors, and is currently at work on her fifth novel. I did not know what to expect from Those Rosy Hours at Mazandaran. I do know that when I chose to review it, the book came with a caveat that it contained dark themes. I was OK with that – I like to stretch my reading muscles now and then. What I got was an amazing trip into some truly dark places but I also got some character types not often – I hesitate to use this word – celebrated in literary fiction. They appear, that is for sure as there are villains galore in the pantheon of reading history but rarely have I encountered one in the 12 year old body of a Sultana of Iran. The story takes place in 19th century Iran but it’s placement in time is not an important part of the tale. In fact, I quite often forgot that I was reading a book that had its characters in a world that took place so many years ago. Either that or I was so immersed in the world that I lost track of current time. The depictions of the palace of the Shah, Afsar’s place of exile, the city of Tehran and it’s residences were brilliant. I felt as if I was walking through the rooms or the forest or whatever village was being described. As to the story – it’s going to be hard to review without giving too much away because it’s a tale that hides evil behind beauty and beauty behind what is most ugly. Afsar is the daughter of the Shah; his eldest child – but she is a girl so she cannot rule. She is adored, spoiled and advanced for her age. We meet her at age 11. Her father has many wives as is traditional and they care little for Afsar as her mother is dead. She is pretty much left to herself with a maid, a tutor and little other guidance. Her father hears of a circus and goes off to find it to celebrate her 12th birthday and its arrival will change her life completely because it brings a young man of outrageous talent and the ugliest face anyone has ever seen. Afsar and Vachon, as this man is known, develop a friendship and this is where it gets difficult to continue for sharing too much of their growing relationship will spoil too much of the book. Just know that in reading this book you will go to the bottom of evil and then some BUT the author does it in a way that still makes your horror at the acts almost hopeful that enlightenment is to be found for our villains. I will not tell you if good triumphs for that would spoil an ending that surprised the heck out of me and I don’t like to ruin books. There are many characters in this tale, some are more well developed than others but none are cardboard or throwaways. I found myself at various times enchanted, revolted, horrified, relieved, exulted and most of all thankful that I’d read a book that challenged me as much as this one did. I had a hard time both reading it and putting it down. It is inspired from Gaston Leroux’s Phantom of the Opera – which I have read – another dark work that I found to make for excellent reading. 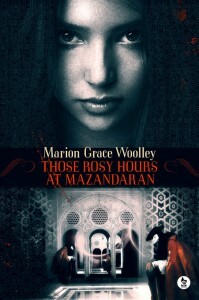 One lucky reader (INT) will win a copy of Those Rosy Hours at Mazandaran. Just enter as many times as you choose on the Gleam widget.